Pure Encapsulations Uric Acid Formula Review – Scam or the Real Deal? 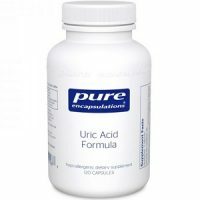 Today the research spotlight falls on Uric Acid Formula, a vitamin and herbal natural gout remedy made by Pure Encapsulations. Pure Encapsulations promotes Uric Acid Formula as being able to support healthy uric acid metabolism, encourage healthy liver enzyme activity, boost immunity-related actions and support alkalization. When the body is in an alkaline state, it is the opposite of being in a state high in uric acid levels. This acid in particular causes the immobilizing pain, swelling and stiffness in the joints that is gout. So what causes uric acid build up? It’s down to the body’s inability to digest purines. The body must use uric acid to do so. This inability is usually two-fold in nature, as it’s inherently genetic but also diet-related. Many protein-rich foods are purine-packed, meaning you have to eliminate them from your diet. Examples are certain seafoods, steak and other red meats, many alcoholic beverages and mainy grains. What’s in Uric Acid Formula? Vitamin C (as ascorbic acid) – Preliminary research has identified Vitamin C as a gout antidote. Potassium (as potassium citrate) – Helps strengthen bones and helps with bone and cartilage regeneration. It also facilitates gout excretion. Devil’s claw (Harpagophytum procumbens and Harpagophytum zeyheri) extract (root) – It makes uric acid more alkaline. However, safe dosages are yet to be established. Cherry (Prunus spp.) extract (fruit) – Research has linked black cherry and tart cherry to decreased uric acid levels, thanks to the flavonoid compounds they contain. Quercetin – Together with bromelain, it combats inflammation. Bromelain (from pineapple stem. The protease enzyme found in bromelain effectively breaks down proteins, so would help with purine digestion. Grape (Vitis vinifera) extract (seed) – This fruit has powerful cleansing and antioxidant properties; it also contains free radicals to help with cell repair and to slow down cell aging. It aids the kidneys and liver with waste elimination, so would play a role in removing toxins such as the crystalized purines. 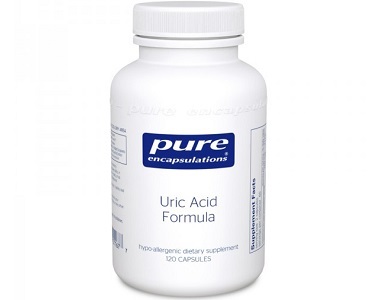 How Do You Use Uric Acid Formula? Take one capsule twice a day between meals. However, if you are pregnant or lactating you should not take this supplement. A bottle of 120 capsules costs $36.60 on the Pure Encapsulations website. There do not appear to be any upsell benefits for buying more than one bottle. The website states that if you are not a healthcare practitioner, you have to obtain the product through their list of professional healthcare distributors. The company is very vocal about selling to healthcare practitioners only. However, we did find the product on Amazon. Here, it retails for $36.60 as well. There is no guarantee on products from unauthorized resellers and given the stated company policy of only selling through healthcare providers – a policy that is clearly stated as excluding mass third-party resellers – it must follow that if you buy Uric Acid Formula through Amazon, you are not eligible to invoke the returns policy. The policy is further fraught with difficulty in that you must further make your return with 30 days, after having had it preauthorized. Since only practitioners can order online through the Pure Encapsulations website, this policy does not seem to cover ordinary consumers. Finally, there is also a 15% returns fee that is leveraged on you when you make returns. It is not clear how much you can return, and whether you can return unopened bottles. All in all, in our researched opinion, we feel that this amounts to zero returns policy coverage for ordinary consumers. We like that this is a hypoallergenic supplement that is free from artificial sweeteners, fillers, binders, preservatives and additions of any sort. Even the coating for the capsules is free from any of these and notably, Uric Acid Formula also contains no magnesium stearate, which can bring on headaches, among other things. It is also gluten, soy and dairy free, plus safe for vegetarians as well. 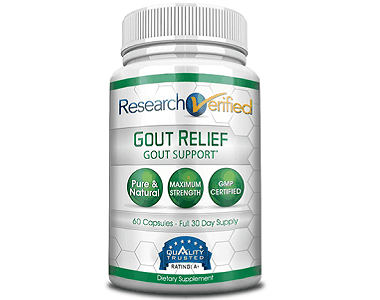 As a total care solution, it includes elements such as devil’s claw, potassium and vitamin C which are seldom found packages with other herbs and enzymes that can ease gout symptoms and help prevent chronic attacks long term. Safe levels of devil’s claw are yet to be established. This may be one of the reasons the product is only disseminated or meant to be disseminated via healthcare practitioners, but in essence is resold by mass resellers as well. It is more expensive than numerous other gout remedies and this may add up long term. However, the major reason we withhold recommendation for this product is the seemingly complete lack of consumer protection from a returns policy point of view (please read ‘Is There a Guarantee?’). If you’re not buying directly from the website, you do not qualify to invoke the returns policy, which is limiting at best to begin with. Since only healthcare practitioners may buy from the website, this excludes ordinary consumers from obtaining policy cover.